What to Get: Either the 1995 Ryko CD or the 2012 UMe CD. Summary: The original CD is just like the vinyl, but worse. The 1995 CD is just like the vinyl, but better - it sounds better overall, and has index separation, but unfortuntately it also adds a little "audio error": from about 01:48 to around 03:31, it's in mono. (Also, an old 8-track tape is very peculiar.) The 2012 UMe CD is identical to the Ryko (and contains the same mono-audio error). ESSENTIAL VERSIONS FOR COMPLETISTS: Depends on how picky you are. The 1995 CD/2012 CD sounds a lot better than the old CD, except for an audio error where it goes into mono for a couple of minutes; moreover, at least one of the between-section edits is also different. The old CD is no hot poop, but allegedly matches the vinyl exactly. The Capitol 8-track is a unique all-orchestral version, and a version of it was released on Lumpy Money. Lots of additional "Lumpy Gravy" wonderment is on Lumpy Money, so completists need that release; among other oddities, it contains a mostly unreleased 1980s remix of "Lumpy Gravy," parts of which contain new overdubs (a heavily processed version of a section of this was released on the Old Masters Box 1 Sampler). Fantastic link: What's on the original Lumpy Gravy? On the vinyl, the words "Francis Vincent Zappa" were printed on the front cover. On the two Ryko CD releases, it was changed to "Frank Vincent Zappa". 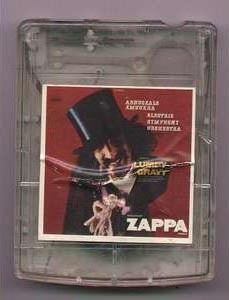 According to Zappa himself, the Capitol 8-track tape of Lumpy Gravy is one of the rarest official Zappa releases - if not the rarest. It contained only orchestral music, and none of the dialoge or band music. (The only words uttered on the tape were "I don't know if I can go through this again", which was spoken by one of the orchestral musicians, and not part of the piano dialogue.) It contains only a couple of minutes of unreleased material. (Fantastic link: What's on the original Lumpy Gravy?). A version of this was later released on Lumpy Money. According to a seller ("Delta Haze") on ebay in January 2000, the item sold was "issued by Madman Earl Muntz for his revolutionary 4-track tape loop auto-stereo but immediately withdrawn for contractual reasons ... The 4-track format is similar to, but was promptly overshadowed by, the 8-track format. It can only be played on a 4-track cartridge player." The tape pictured on your website is definitely a four-track, not an eight-track. First of all, 4-tracks are easily distinguished from 8-tracks by looking at the back. A four-track tape has a large hole in the back, where the capstan came up out of the machine into the tape. Secondly, the 4-tracks that Capitol licensed from Muntz had clear front shells; their 8-tracks in 1967-68 were opaque white. Finally, the usual prefix of a Capitol 4-track was 4CL, exactly as your 4-track has it. The prefix of a Capitol 8-track was 8XT. 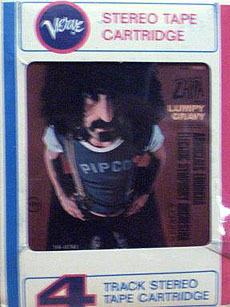 Now, it's possible that Zappa himself actually knew of an 8-track copy of the album. If that is so, the 8-track shell would be white. The 8-track would have separate front and back slicks. The back cover slick would be mostly white (with possibly a pink border). ... perhaps copies also got out in the reel-to-reel tape format, too! If any exist, they would have been housed in brown boxes with a cover slick attached. The tape would have the number Y1T 2719. If a reel-to-reel tape exists, it would be much scarcer than the already rare 4-track (or LP, or 8-track), so it's quite possible that none have been discovered. A blurred photo of a Verve 4-track can be viewed to the right. (The torture never stops, does it?) 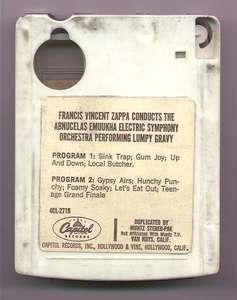 As on the Verve 8-track, "the title tag on the slipcase as well as the end label and back title label on the tape itself all credit the Abnuceals Emuukha Electric Symphony Orchestra & Chorus; Zappa's name is only visible in the front cover artwork (which is the same as the Verve LP)". Zappa had a contract with MGM Records, when Capitol Records wanted him to record an orchestral album. Zappa was to appear only as conductor and this wouldn't have touched the contract with MGM. Zappa recorded this album with the Abnuceals Emuukha Electric Orchestra in New York, but it wasn't released. Only 8-track tapes exist. 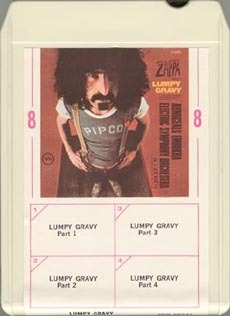 Later Zappa added some Mothers music to the recordings and MGM released the well-known Lumpy Gravy album in may 1968. FRANK ZAPPA: Nonetheless, MGM refused to allow this album to be released, and there was an argument over it for a year, finally resulting in MGM buying the master tape from Capitol, and then, I added the vocal parts in there, and it came out. 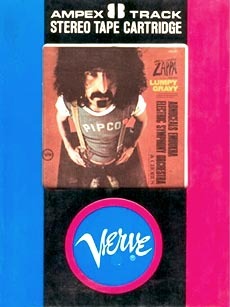 The US release was the first Zappa album to be issued with a black Verve label instead of the blue one which MGM normally used for their "pop releases". The story goes that since Lumpy Gravy was largely an orchestral work, it was given the black label which was usually reserved for MGM's more "serious and worthwhile" jazz releases. The exception to this rule was the compilition Mothermania which appeared in 1969 with both black and blue labels. Once again, EMI excelled themselves by issuing the original UK version with its intended gatefold sleeve although, as before, the laminated sleeve and "flaps" distinguish it from the Polydor re-issue. The balloon on the back cover of the vinyl reads "Is This Phase 2 of: Were Only In It For The Money?" with the apostrophe missing. On the CD release, this was corrected. Some time ago I bought a vinyl copy of Lumpy Gravy. It has the black Verve label and is numbered V6-8741, so it seems to be an original one. However on the inner sleeve and on the label it says "Made in Germany". BERNELIS: Here's something that always interested me. In the US, the vinyl Lumpy Gravy Verve release came out in two versions of the cover. One version had a red background with a green "Pipco" shirt. The other version had a green background with a red "Pipco" shirt. What is the story of this? LEWIS SAUL: Uh, you're saying green and black, the cover? FAST FRANK: ... you know, I remember looking at the original album when it came out (which I didn't have the foresight to buy on the spot), and then again when I bought a copy in 1974, and I always had this nagging feeling that the covers of each were different. I've never seen any reference to it ... and I just figgered it was one of those faux nagging feelings. I own a monaural promo copy of this LP, and unlike the first three Mothers albums, this is simply a reduction of the stereo mix (with perhaps a bit of added compression, to make it sound better on radio). I've never seen any stock copies of the mono Lumpy Gravy, but it's possible that they exist - according to the Billboard album chart for 8 June 1968, it was available in both mono and stereo. LEONARD J LOS: I own mono DJ copies of both We're Only In It for the Money and Lumpy Gravy and the sound is by far superior to any other releases of these two LPs. I wish I had a mono copy of Cruising with Ruben & the Jets but I'm sure this was never released either as a stock copy or DJ. I have seen stereo copies of the yellow Verve and the white Verve promos. BIFFY THE ELEPHANT SHREW: Is the Lumpy Gravy really mono? On both sides? The only "mono" copy I've ever seen had (judging by the matrix numbers; I didn't get to play it) one side mono and one side stereo. I used to own a mint UK mono copy (which I regrettably sold for a measley �50 ...) and remember the mix was only slightly different to the stereo mix (in fact, I remember taping it, I'm sure I still have it ... I must find it ...). It was a reduction the the stereo mix but the sound was much, much cleaner and in some ways sounded better than the stereo mix. When I find that tape, I'll let you know! Staying in New Zealand for a moment, we'll deal quickly with Lumpy Gravy. Although a copy couldn't be located for the purposes of this feature, it seems fairly certain that Zappa's first solo LP was issued in NZ (Verve V/V6 8741). This 8-track version was not at all like the ultra-rare, orchestral and instrumental Capitol version - it was like the vinyl, but with the sides reversed. Tracks 1-2 are side 2 of the LP, and tracks 3-4 are side 1. Frank is eighteen when he hops on a Greyhound headed for Los Angeles to seek his fortune. He gets a job selling records, he practises the guitar and through a friend producing films he becomes the youngest person ever to score a motion picture. A few more years of writing filmscores, when at 22 the idea of forming a band started taking shape in his head. He started with a highschoolband in the fifties and by the time when the English invasion was in full force he had a pretty weird group that was called Captain Glasspack and his Magic Mufflers. Quite a few musicians came and went before they became an important influence on rock music. In spite of their outlaw position with deejays, record chain owners, and theatre-managers, their first album Freak out! [sic], which is probably the freakiest of them all, became a chart success. One of Frank's musical experiments that are now generally considered as rock & roll masterpieces is certainly the ballet Lumpy Gravy. Some of the Mothers and a huge orchestra made up of America's best session men, became the Abnuceals Emuukha Electric Symphony Orchestra and Chorus with Frank conducting Lumpy Gravy part 1 and 2. It is this album, that is released as Superstarshine vol. 26, that every Mothers-fan should turn on to. My copy is a Polydor UK issue, with the usual Polydor catalogue number on the label, &c. However, the sleeve has the SVLP catalogue number and is a Garrod & Lofthouse flipback, with laminated front, like the EMI/Verve issue, but is has no mention of EMI or Polydor on it whatsoever. Odd? I can only assume that Garrod and Lofthouse had a load of covers left over when distribution changed from EMI, but as to why the covers have no EMI information on them, frankly, I'm stumped. The period between 1969 and 1972ish seems like a real grey area with regard to the Verve albums. When this album was first released on CD, it was coupled with We're Only In It for the Money on one disc, in one CD case, with the original mix but with severely truncated cover artwork (restored on the 1995 CD). As the original vinyl had no track separation, just side 1 and side 2, the CD only had two tracks, "Lumpy Gravy" parts one and two. When Ryko re-released this album, it was separated from We're Only In It for the Money (the original CD had been a two-for-one), and the disc had CD indexes - provided and titled by Zappa himself. It also included some new artwork: an inlay sheet behind the tray - in the words of Cal Schenkel, a "photo by CS from one of the recording (actually mixing?) sessions at Apostolic (left to right - Richard Kunc, FZ, Don Preston)". I've found there's two extra bass notes at the beginning of King Kong in the Lumpy Gravy 1995 Ryko CD, compared with the We're Only In It for the Money/Lumpy Gravy CD from 1985. I don't know if those two notes are in the original vinyl also or what. Putting it briefly, the new mix lapses into MONO from approximately 01:48 to just after 03:31. Listen to this passage through headphones. Suddenly at 01:48 all the instruments are at the center of the soundscape with some digitally added ambiance giving the aural illusion of spaciousness, but there is no separation. Then suddenly, just after 03:31 a rather jarring thing happens. The instruments "fly" into the left- and right-hand speakers in your headphones - not on the beat, mind you. It sounds like someone in the engineering booth suddenly woke up and realized he was mixing it in mono, and hit a switch to separate the instruments into right-and-left. Uh-oh. I'm afraid this is one of those that slipped past me (and FZ). As has been mentioned here before, both We're Only In It for the Money and Lumpy Gravy were resurrected after safety copies of both were unearthed in the vault. It was from these safety copies that most of the '95 release of Lumpy Gravy was taken. This tape had just as many razor-blade edits in it as the original (I guess that's the way FZ assembled safeties in those days ... I would have just made a copy of the newly edited master) so I guess we just assumed it was the same exact material with the exception of being played many fewer times than the original master. The switch to mono went unnoticed by me and FZ and now I'm itching to get back in and fix it! [Note: this was in late November 1998, when Spencer was just leaving the Zappa Family Trust - the mistake was not fixed for the 2012 CD Ed.] The switch back to stereo was on a beat chosen by FZ probably for ease of razor blade editing. As for the credits on the record, there are a few of the Ryko re-releases that still credit Bob Stone for the mastering (artwork on the Au20s [Apostrophe (') and Over-Nite Sensation], Does Humor Belong in Music?) and Ryko claims that the reason for that is that they wanted to leave the original artwork intact. Of course, that didn't stop them from removing some of the original Zappa logos and inserting their own. However, I can assure you that nothing was re-mixed. It was simply re-transferred using better converters and re-edited to fix any parts that had gone away completely. Also, there is no "mono" button on my system. And if there was, it's not the type of thing where I would pop the "mono" button in for a while and then decide to remove it later. The only differences I could detect was the mono section, and a shorter pause right before the "round things are boring" line. If there are any other differences, they are microscopic. And as with WOIIFTM, the 1993 master sounds a hell of a lot better than the Verve LP. It was only recently that I bought me a CD player that picks up indexes. Of course I was intrigued to see if those indexes on Lumpy Gravy were correct. Here's what happened: everything was going fine all the way to index 8 ("Switching Girls"). Then at 07:12 where "Oh No Again" (index 9 according to sleeve) is supposed to start it's still index 8 according to my CD player. Same thing with "At the Gas Station" (index 10 according to sleeve) at 09:18. CD player still shows it's index 8. With "Another Pick Up" at 11:05 index finally changes to 9 (it's 11 on the sleeve) and "I Don't Know ..." which is supposed to be index 12 at 11:59 is in fact index 10. However, the second part is OK. The original Capitol version of the album (in mono, and difffering slightly from a previously circulating version). Several alternative edits, sections, and wonderful treasures. In 2012, Lumpy Gravy was reissued by UMe/Zappa Records. It is reported to match the old Ryko CD, and therefore contains the same switch to mono in "Oh No." What about some details on cassette versions? How about the Old Masters version? Are there any other changes on the '95 version? Are there any regional peculiarities?